Steamboat Bill Jr. is Buster Keaton’s final independent film, though not necessarily the last one in which he had creative control. His first work with MGM, The Cameraman, could be said to hold that title, so when you watch Steamboat Bill Jr. there is not the same sense of the bittersweet you may get when watching Keaton’s final 1928 masterpiece. However, there is something grand about Steamboat Bill Jr., not just in its dazzling final hurricane sequence, tight sense of plotting and structure, or Buster’s increasingly creative pratfalls, but in the emotional heart of the story, young Willie Canfield’s efforts to simultaneously please his father Bill Sr. (Ernest Torrance) and be with his college girlfriend, Kitty (Marion Byron)— a hard task, considering her father and his are rivals in the river boat transportation business. It is true that Keaton’s films often show his characters more comfortable with props and animals than other people; this is perhaps the largest reason why his characters feel otherworldly, as though he hailed from another dimension altogether and were perplexed by ordinary human interaction. Perhaps more than any of Keaton’s previous films, Steamboat Bill Jr. has Keaton interacting with other characters constantly, and they are some of the most interesting supporting characters in his oeuvre. Keaton’s feature characters don’t often have families. With the exceptions of the aunt in Our Hospitality who warns him of the feud, the parents in Battling Butler who push him to “rough it” in the wilderness in order to become less dependent on luxury, and the doting mother in College (played by 1910s comedienne Florence Turner, no less! ), most Keaton protagonists are loners looking for a place to call home or at least someone to share home with (often a love interest, sometimes a cow). Yet in Steamboat Bill Jr. unlike any other Keaton movie, the protagonist’s family is a source of conflict. In Keaton’s short work, Torrance may have been purely the heavy with his scowling face and towering build, but here that function is complicated: he is the bullying heavy, but he is also Willie’s perplexed father. Willie’s petite frame, stylish clothes, and enthusiastic ukulele-playing have the burly Bill fearing his son may be a wimp at best or a touch “purple under the collar” at worst. And while Willie’s relationship with Kitty may dispel the latter anxiety, his prime desire is to make Willie more of what he thinks a man ought to be. Being a son who wants to please the father he’s never known, Willie agrees to go along with it. Irritated with his son’s college boy aesthetic, Bill Sr. takes Willie to the hat shop to try on a series of comically oversized hats. Of course, the scene is funny, what with the silly headwear and Buster’s attempts to look as dignified as possible in them, but the scene is hardly frivolous or throwaway. It serves an important narrative function: the main conflict of the film is father versus son, or perhaps more specifically, the father wanting to fashion his son into his own image. Yet the moment Bill Sr. is satisfied with a hat and the two Canfields leave the shop, the headwear is blown off of Willie’s head the moment they leave the shop. Already, we are shown through the visuals that Bill’s mission is a doomed one; Willie cannot be changed and, as we come to learn later, should not be. In the end, Willie more than proves himself, as Keaton’s heroes often do. Yes, he may not be physically intimidating or as willing to pick a fight, but he does manage to possess bravery, intelligence, and resourcefulness when he rescues Kitty and Bill from drowning. Willie is also forgiving. Both Bill and Kitty want Willie’s complete, unwavering loyalty to one or the other of them; both become angry when he fails to split ties with either of them. Rejected by both, Willie has no reason to stay in Mississippi, yet he sees his father in distress and stays to help him. After rescuing his father and his girl, all three reconcile and are allowed to live happily ever after. Keaton’s last two truly Keaton-esque features, Steamboat Bill Jr. and The Cameraman, allow his protagonist to be more vulnerable in a way, put into situations where we see more of his emotional side in regards to human interactions. Not that he is cold or machine-like in his earlier features as some silent film aficionados have claimed: for me, his hurt and humiliation during the early scenes of The General, where Annabelle Lee rejects him, are moving— though Keaton does not keep you feeling sorry for his hero for long because dammit, we’ve got a train engine to save! But the intensified emotional qualities of these two films make them stand out, all culminating in that famously heartbreaking descent into the sand scene in The Cameraman. The father-son moments and romantic scenes in Steamboat Bill Jr. and much of The Cameraman are perfect illustrations of what film scholar Imogen Sara Smith means when she claims Keaton’s movie persona is like “Baked Alaska in reverse,” cool to the touch, warm at the center. I watched this magnificent film again last night. Nitrate Diva’s write-up from four years ago is divine, a wonderful close reading of a single moment in the movie which speaks volumes about its themes. Give it a read! I need to reign myself in when writing about Frankenstein. God knows, I could easily concoct a series of blog posts about Colin Clive’s hair alone. So, I’ll isolate one moment that has always fascinated me and try to bring it ALIVE! Recognize the scene? This is a pristine publicity still, I believe, but you can still get the gist (and some extra angst!) from my slightly murky screenshots. The monster has dragged his maker to the windmill. Henry Frankenstein wakes up and tries to run away, but the creature stops him and they take up positions on either side of a turning wheel in the mechanism of the mill. In shot-reverse-shot, we get Frankenstein looking at his creation and the thing looking back, as the gear continues to turn between them. There’s just so much in these two shots. They conjure up a multiplicity of meanings. The House of Darkness is rather unsung as far as Griffith’s short films go. It’s about the soothing effect of music upon a mentally deranged man, one which becomes a major boon when he breaks into the home of a former nurse. While the video above cites Lionel Barrymore and Lillian Gish as the stars, it is Claire McDowell as the nurse and Charles Hill Mailes as the mentally ill patient who are the real stars of the show, beautifully underplaying parts which could have easily turned hammy. Also am I the only one who thinks the shot set-up at 9 minutes and 56 seconds in looks a lot like the famous scene from James Whale’s Frankenstein where Karloff breaks into the bride’s chamber? The use of suspense there, with the woman unaware of the potential danger behind her, is very similar between the two movies. Always cool to hear more silent era discoveries are being uncovered, even in the modern world! Click to enlarge – newly discovered footage from My Wife’s Relations at the Alvarado Arms. Click to enlarge – an entirely new stunt – who knew this was awaiting discovery for 95 years? 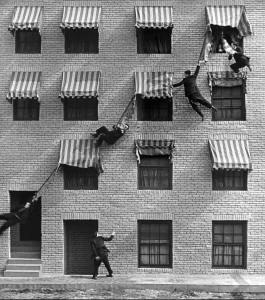 An astonishing new Keaton stunt, Buster’s return visit to a classic apartment house, and yet another surprise appearance of the Cops – The Kid – Safety Last! Hollywood alley – the Lobster Films restoration of My Wife’s Relations (1922), with over a minute of restored footage unseen for decades, is a cornucopia of new discoveries and delights. I just realized this morning that it’s Malcolm McDowell’s 73rd birthday! One of my favorite actors of all time, he’s the sort who can make even the worst movie worth a look (see the woefully mangled Caligula). Being swamped with summer course work at the moment, I have not been able to keep up with the old blog as much as I would like to, so I’ll just share two McDowell-related videos with you that are favorites of mine, one with substance and one that’s a little more frivolous. Here’s a nice interview from 2014 where McDowell discusses some of his performances in his most famous movies: If…., Time After Time, Caligula, and of course, A Clockwork Orange. I love listening to him talk; great sense of humor and lots of cool anecdotes. Anyways, happy 73rd Mr. McDowell, you’re one of a kind! The Passion of Joan of Arc is one of a handful of movies which made a big impact on my life– not just as a cinephile, but as a person. Preachy junk like the Left Behind films have nothing on this masterpiece, which examines faith and suffering with such power that no one who has ever seen it has forgotten it. The Criterion Collection release of the movie comes with the “Voices of Light” score by Richard Einhorn, a beautiful piece inspired by prayers and medieval music. Here is a video with excerpts from that score. Enjoy! Now there’s nothing wrong with any of those films listed, but the reason I love reading about people’s personal favorites is that I feel it shows a part of who they are; not just their tastes, but the kind of stories and characters which make them think, make them feel, make them thrilled out of their minds, make them happy when they’re feeling blue, make them cry when they need a good cry. Only on a personal favorites list could Tim Burton’s Batman and Citizen Kane amiably sit side by side with no worries as to which one is “objectively” the “better” work. It’s all about how the individual responds. And the response to every movie will be different. No matter how acclaimed or beloved one film is, there will always be a person left cold or annoyed by it. On the flip side, no matter how derided a film is, there will always be someone who loves it. This, to me, is a thousand times more interesting subject than yet another boring, predictable “BEST FILMS EVER” list with the same old movies paraded again and again, with critics and filmmakers claiming to be “objective” in their selection. As though we could ever be one hundred percent objective about art, one of the most subjective things known to man!